A wave of violence and intimidation has engulfed Mexico in recent weeks as the country prepares for midterm elections on June 7, with gunmen killing four candidates and kidnapping dozens of residents in Guerrero state — reviving fears that the still-unsolved disappearance of 43 students last September was not an isolated incident. 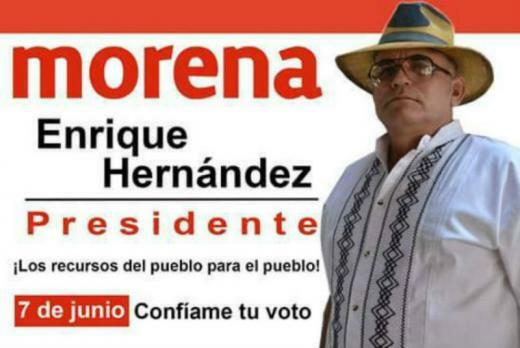 Enrique Hernández, who was running for mayor of Yurécuaro in the western state of Michoacán for the left-leaning Movement for National Regeneration Party, was killed on May 14 when gunmen opened fire on his campaign rally. Hernández was a leader of the town’s self-defense group formed in 2013 to curb the power of the Knights Templar cartel. The state’s attorney general, José Martín Godoy Castro, said Wednesday that the Yurécuaro’s police chief and two of his aids knew about plans to kill Hernández, and left town ahead of the murder. Godoy said he would file charges — of participation through omission in a homicide — against the three officers. Less than an hour after Hernández’s murder, gunmen shot Héctor López Cruz 16 times as he returned from campaigning in Huimanguillo, in the southeastern state of Tabasco. López was running for city council of Huimanguillo on the ticket of the ruling Institutional Revolutionary Party (PRI). Visit here to know more about the 2015 elections in Mexico. Visit here to check the broadcast of our latest event on elections. The weeks leading up to Mexico’s June 7 regional elections have been a violent affair, with a slew of murders of candidates in some regions. The federal government assured the public it was providing security for candidates facing violence, while attempting to play down the security threat. Interior Minister Miguel Angel Osorio Chong, speaking at a press conference Tuesday, said the government had a strategic plan to guarantee security for candidates in areas where homicides and drug-related violence are rampant, including the states of Jalisco, Guerrero and Tamaulipas. “We hope [the plan] will deliver results and the peace we are asking for,” he said. Twenty candidates so far have asked for government protection and will receive it, he said. Visit here to know the parties that are competing in this election. Visit here to check our publications on Security and Rule of Law. Can Mexico’s Electoral Authority Stop Criminal Funding? Mexico is weeks away from a landmark midterm election, but many analysts worry that the nation’s electoral authorities are dropping the ball as far as criminal organizations financing their preferred candidates. On June 7, Mexico will elect the entire lower house of congress, nine governorships, and local offices in more than half the country. While the Senate and the presidency are not in play, it is the most important date in the electoral calendar prior to the 2018 election. Against that backdrop, some analysts are worried that the nation’s campaign regulatory agency, the National Electoral Institute (INE), is not doing enough to prevent the flow of money stemming from organized crime into candidates’ campaign war chests. Jesus Tovar Mendoza, the Executive Director of the think tank Red de Estudios sobre la Calidad de la Democracia en America Latina, recently complained to E-Consulta that the statutes enforced by the INE are insufficient. According to Tovar, campaigns have to make detailed filings outlining what they spend, but the INE does little to verify where the money comes from. As a result, criminal groups are able to provide cash or in-kind benefits to campaigns or directly to voters in order to sway votes. And since INE leaders are heavily reliant on the political parties for their posts, there is a heavy disincentive to crack down on illicit funding, because all of the parties benefit from extra cash flowing through the campaign coffers. Mexico has long struggled to deal with illegal political money. In the aftermath of Enrique Peña Nieto’s presidential election in 2012, journalists and investigators turned up evidence of his party’s illegal vote-buying schemes financed through prepaid debit cards. Some of the financing for these cards was traced back to figures linked to organized crime. Mexico has also, of course, long suffered from the links between politicians and criminal organizations, which can be solidified through campaign contributions that essentially buy a politician’s loyalty. The clearest example of this is the rash of prominent and powerful politicians who have been exposed as criminal allies, from former Michoacan Congressman Julio Cesar Godoy to Jose Luis Abarca, the former mayor of Iguala, Guerrero. There is also the possibility that organized crime dollars could influence the outcome of the election. While swinging a presidential election in a nation of 110 million is a tall order, it is completely plausible to buy enough votes to influence a close gubernatorial election in, say Colima, a key Pacific state where 140,000 votes will likely be enough for a victory. That is to say nothing of the lightly contested local races around the country. The INE was originally created in 2013 to replace the now-defunct Federal Electoral Institute (IFE). While organized crime was not a direct cause of the switch, the new agency at least theoretically should have helped limit the presence of dirty money in elections. The INE centralized the electoral apparatus, and reduced the role of state tribunals that were largely beholden to governors. Because state governments are widely seen as being more susceptible to corruption than their relatively honest counterpart at the federal level, particularly with regard to organized crime, this shift theoretically should have produced a less vulnerable electoral framework. This logic, popular though it is in Mexico, appears to have been faulty. And not for the first time: many analysts have long advocated for the disappearance of Mexico‘s thousands of municipal police departments, again on the untested theory that the mere centralization of the forces into 32 states will translate into more effective police. As with the INE’s replacement of the IFE, this was overly simplistic. The persistent problems at the INE also demonstrate that institutional reform is a very tedious process. Mexican leaders have long demonstrated a fetish for creating new agencies when old ones fail. This is especially true in the security realm; Mexico has cycled through countless new federal police bodies over the past twenty years, none of them markedly better than their predecessors. The reason is that merely creating a new institution does nothing to strengthen it. On the contrary, often the same pathologies afflicting the old agency are absorbed into the new one. And while improving institutions is both a laudable and vital enterprise in Mexico, there is no reason to expect it to occur simply by decreeing a brand new entity. A new name is little more than a first step. It’s hard to determine at this stage how much damage there might be from criminal groups financing politicians. It seems unlikely that the new class of leaders will be especially vulnerable to narcos, since this is not a new problem. Nevertheless, it remains clear that this is one of a number of persistent security challenges that Mexicohas been unable to surmount. And the result is a political class of which the nation is rightly suspicious. Mexico has grown quite competent at rooting out its most dangerous criminals with regularity. A more effective INE would be an effective tool in also reining in the criminals’ political supporters, but it remains a far-off goal. Click here to visit the original post. Two candidates in Mexico’s upcoming midterm elections were shot to death in different parts of the country amid a wave of violence and intimidation of candidates ahead of balloting next month. Enrique Hernandez was in the middle of a campaign event in the town of Yurecuaro in Michoacan state when he was hit by shots from a moving vehicle Thursday about 8:10 p.m. He was running for mayor for the left-leaning Movement for National Regeneration, or Morena, party. Less than an hour later, in the southeastern state of Tabasco, Hector Lopez Cruz, a candidate for local councilor for President Enrique Peña Nieto’s Institutional Revolutionary Party, or PRI, was pumped with 16 bullets on his doorstep in the town of Mecatepec. The assassinations come less than two weeks after Ulises Fabian Quiroz, a mayoral candidate for a coalition of the PRI and the Green Party, was slain in Atzacoaloya in the state of Guerrero. Another aspiring candidate in Guerrero was killed and beheaded in March, and two others were kidnapped and then released. The campaign for next month’s mid-term elections in Mexico was marred by violence in the southern state of Guerrero on Friday when a ruling party candidate was shot dead by crime gang members. Ulises Fabián Quiroz, a mayoral candidate in the municipality of Chilapa – located about an hour from state capital Chilpancingo – was dragged from his car, beaten and shot at least 15 times, authorities said. The murder of the Institutional Revolutionary Party (PRI) official drew strong condemnation from all parties vying for mayoral, legislative and gubernatorial posts in Guerrero – one of the poorest and most violent states in the country. “This deplorable action has forced us into mourning and to think about the climate of insecurity that prevails in Guerrero,” said Héctor Astudillo, the PRI candidate for governor who suspended his campaign and attended Quiroz’s funeral on Sunday.